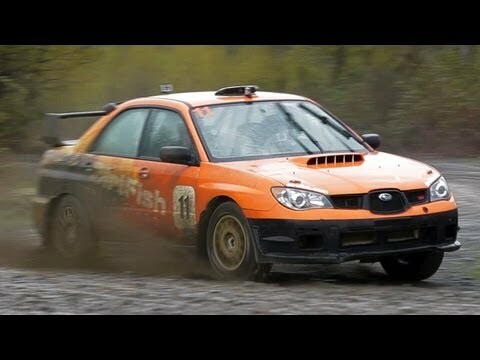 On this episode of The J-Turn, I head to Washington state for my first foray into rally driving at Dirt Fish Rally School. There, Don Wooten teaches me the fundamentals of rally car control in the school’s 2007 Subaru WRX STI, whose 4-cylinder, turbocharged engine produces 300+ horsepower. From the skidpad to the slalom and The Boneyard, I try my hand at every course and, by the end of the day, declare myself ready for The Wedge. Situated as a full rally stage, The Wedge offers real rally driving, and making one mistake can equate to wrapping your car around a tree. Find out what happens when I head out onto the challenging circuit and see how effectively I’m able to apply my newfound rally knowledge. WRX STI*, whose 4-cylinder, turbocharged engine produces 300+ horsepower. how effectively she’s able to apply her newfound rally knowledge. This looks so fun. He seems like a great teacher too. coast should I move there. id love to do rally as a job. Awesome, would love to do this. What kind of mud flaps do they use? left foot braking muddy subies! gotta love it! Don Wooten is a really cool guy, just spent the last three days with him at dirtfish. Had no idea this school existed, and I live in Washington. I will definitely try to go there soon. Oh come on,girl!Don’t make yourself to look so stupid.You can more than this.You are in an auto magazine…Show us what you really can.Please! Nice, I’m assuming she was cooking my dinner under the hood of the car with the engine heat…. otherwise there will be hell to pay. That was awesome! I’m a avid rally fan and I love that you are including all types of racing. Make more! Are there any readable content on the web about these instructions given to Jesse i.e when the brake, etc in different phases of taking a corner? ah okay so you brake to transfer the weight to the front and accelerate to shift the weight to the back…. rally is so tough.. you got know more concepts like throttle management, how to get the best amount of traction, determining the limits of the car, adapt to different conditions, remember the line…. oh WRC is the hardest and toughest motorsport! There’s nothing worse than paying for a car ‘experience’ and the car breaking.